On February 28, 1995, the Bank of England announced that the Barings bank has sudden losses which exceed the 265 million pounds (around 390 million euros) and which each new reduction in a point of the Nikkei index involved 70 million additional pounds of losses (around 100 million euros)! What did it passed so that the sixth British bank of businesses suffers such a reversal? This bankruptcy rested on only one man, his top trader of Singapore, Nick Leeson, who speculated in the rise of the Japanese Nikkei index. He could not envisage the earthquake of January 17, 1995, in Kobe, second port of Japan. From this catastrophe the Japanese index fell. It equalized its value of January 2005 only in December 2005, that was to say eleven months later! It was thanks to a very sophisticated mechanism that Nick Leeson succeeded exceeded his capacities and deceived his company leaving a pit of more than 600 million euros. March 06, 2005, Barings was sold at a Dutch bank. We will seek in the birth chart of “Number One” English, the Queen Elizabeth II, the analogies of these facts. It is clearly understood that she is not any responsible with respect to them. The earthquake of Kobe on January 17, 1995 at 5 a.m. 46 in Japan occurred at the English hour of 8 p.m. 46, January 16, 1995. The sale of the bank was obtained on March 06, 1995. 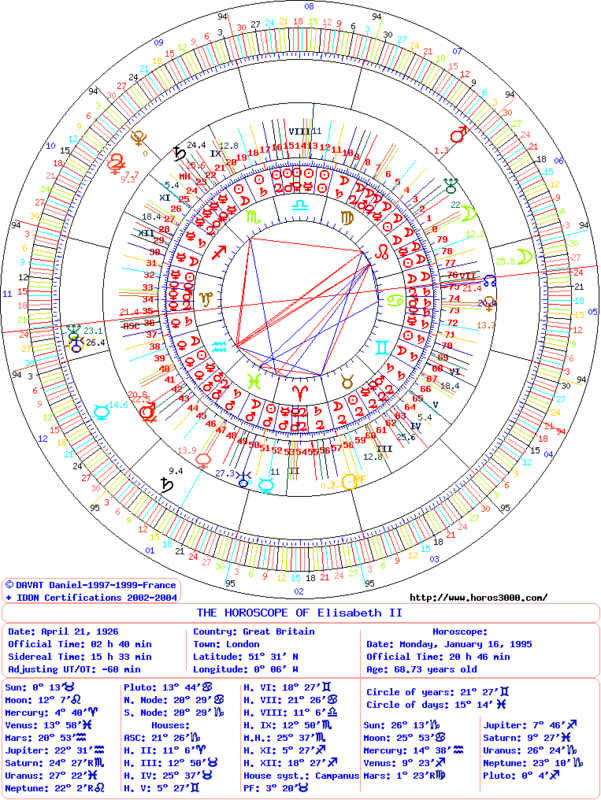 The point of convergence of the circle of the years: 21°27′ in Gemini on a degree pertaining to Mars and Jupiter. This sector has a feeble force (in House VI). Position of the degree of the day: 15° 14′ in Pisces. It is positioned in conjunction with natal Venus (to within 1°16′) and Saturn in transit (to within 5°47′) in Pisces. Position of the degree of the day: 3° 13′ in Taurus. It is positioned in conjunction with Sun (to within 3°) and with the Part of Fortune. The Moon is the master of the period. It has a powerfull force (in nocturnal birth). It has a beneficent quality but attention it is ambivalent concerning the financial sector. Indeed, this last is represented in the natal one by the conjunction Sun and Part of Fortune in House II. This determining solar energy of the richness forms a square aspect (12°) with the natal Moon! Venus in Pisces (of very beneficent quality) in a degree of Jupiter has well an analogy with the richness and can also symbolize a bank of business because it is also a governor of the Sun and of the Part of Fortune in Taurus (governor of the first 8 degrees of the Taurus in nocturnal birth). It is attacked by the Saturn transit, determinant of the pains and the bankruptcies. 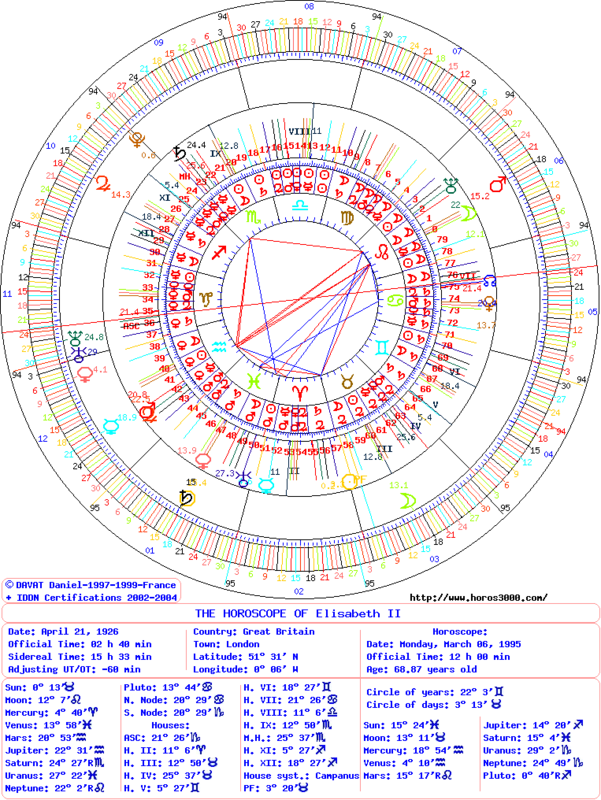 March 06, 1995 coincides with the third degree of Taurus in conjunction with the Sun and the Fortune Part, the determining astral energy of the richness in the chart of the Queen Elizabeth II. The purchase of Barings cost Dutch bank ING 610 million pounds (900 million euros to the course 2006)! At the time of the sale, the transits of the Sun and Saturn are in conjunction with a degree of the position of the day of the earthquake of Kobe (15° of Pisces) which characterizes also this bankruptcy and the Bank Barings (Venus in Pisces, governor of the Sun and of the Part of Fortune)! This position is determining loss (Saturn) resounding (Sun) of this banking company (Venus). General Motors got to benefit from the law of protection against the bankruptcy. This entry was posted on Thursday, July 12th, 2012 at 9:30 pmand is filed under Finances. Both comments and pings are currently closed.